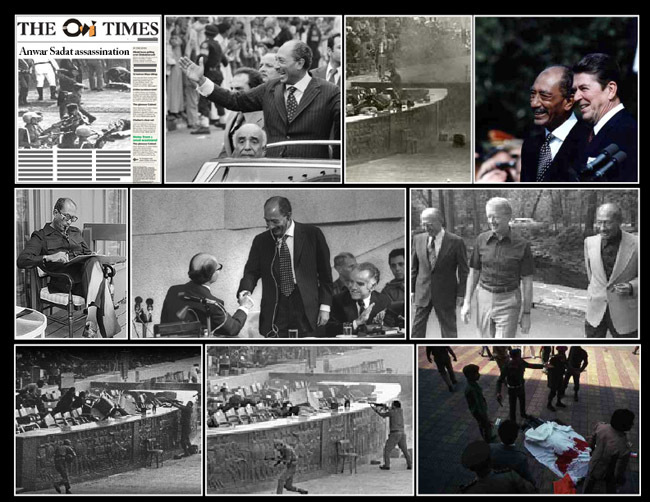 October 6th 1981; Islamic extremists assassinate Anwar Sadat, the president of Egypt, as he reviews troops on the anniversary of the Yom Kippur War. Led by Khaled el Islambouli, a lieutenant in the Egyptian army with connections to the terrorist group Takfir Wal-Hajira, the terrorists, all wearing army uniforms, stopped in front of the reviewing stand and fired shots and threw grenades into a crowd of Egyptian government officials. Sadat, who was shot four times, died two hours later. Ten other people also died in the attack. Despite Sadat's incredible public service record for Egypt (he was instrumental in winning the nation its independence and democratizing it), his controversial peace negotiation with Israel in 1977-78, for which he and Menachem Begin won the Nobel Peace Prize, made him a target of Islamic extremists across the Middle East. Sadat had also angered many by allowing the ailing Shah of Iran to die in Egypt rather than be returned to Iran to stand trial for his crimes against the country. Libyan leader Muammar Qadaffi, who sponsored Takfir Wal-Hajira, had engineered his own unsuccessful attempt on Sadat's life in 1980. Despite the well-known threats on his life, Sadat did not withdraw from the public eye, believing it was important to the country's well-being that he be open and available. Before executing their plan, Islambouli's team of assassins took hits of hashish to honour a long-standing Middle Eastern tradition. As their vehicle passed the reviewing stand, they jumped out and started firing. Vice President Hosni Mubarak was sitting near Sadat but managed to survive the attack. Taking over the country when Sadat died, Mubarak arrested hundreds of people suspected to have participated in the conspiracy to kill Sadat. Eventually, charges were brought against 25 men, who went to trial in November. Many of those charged were unrepentant and proudly admitted their involvement. Islambouli and four others were executed, while 17 others were sentenced to prison time.